Signing the Freedom of Information Act doesn’t appear anywhere in LBJ’s Daily Diary. Document 2: Statement signed by Lyndon B. Johnson, “Statement by the president,” Attached to Cover Note. Includes Variants, (1): Unsigned Draft; (2) Draft II Annotated by LBJ himself, (3) Annotated Draft with Handwritten Note from G.C. Washington DC, July 1, 2016 - Fifty years ago on July 4, 1966, Lyndon Johnson signed the landmark Freedom of Information Act while vacationing at his Texas ranch. 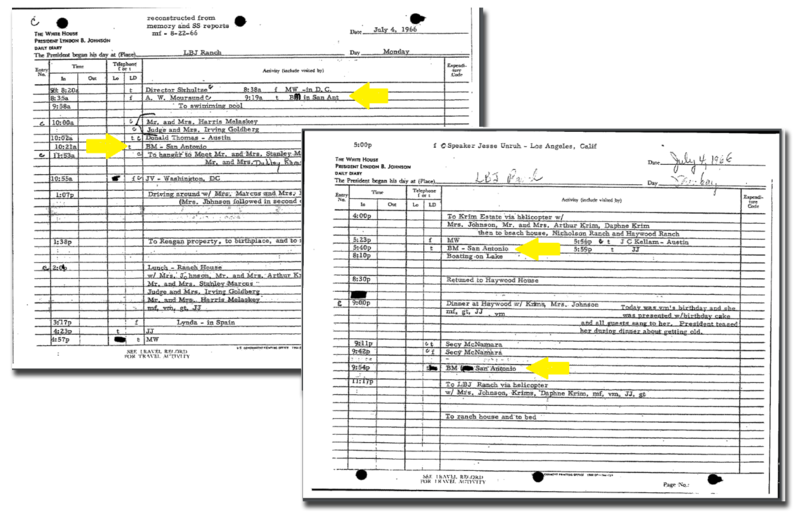 But the event does not even appear in LBJ’s Daily Diary, which is the first indication that something was amiss on the Pedernales. In fact, the record shows that the launch of this bedrock piece of American democracy, replete with lofty public expressions of pride and patriotism, was actually met with profound ambivalence throughout the administration. Documents from the LBJ library show that the normally gregarious president, who loved handing out pens at bill signings, refused even to hold a formal ceremony for the FOIA, personally removed strong openness language from the press statement, and only agreed to approve the bill after the Justice Department suggested LBJ issue a signing statement that undercut the thrust of the law. 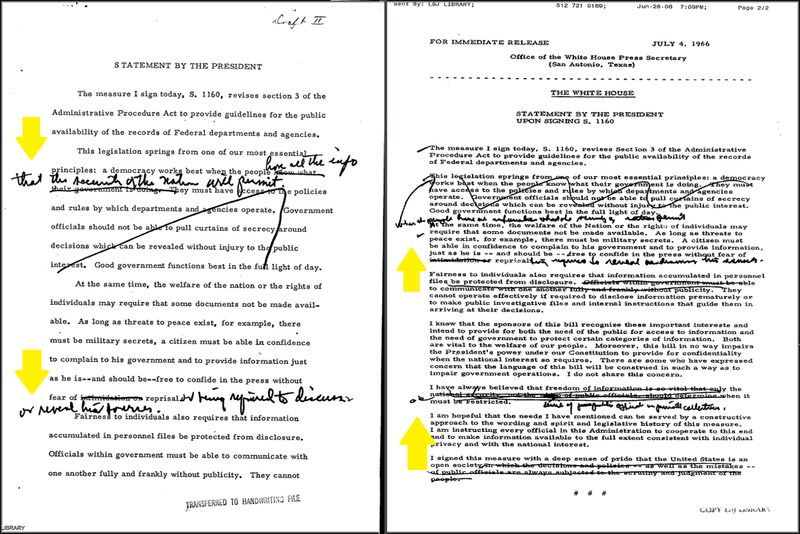 LBJ’s handwritten notes to the FOIA signing statement (L), Bill Moyers handwritten edits on typed signing statement. But by the spring of 1966, the Senate had passed its own version of Moss’s legislation and Bill Moyers had heard unanimous support from the journalists he was dealing with as press secretary. Other White House staff were getting the idea that the train was leaving the station. White House counsel Milton Semer talked directly with Moss, connected Moss with Moyers, and even suggested to Moyers that he “exploit the fact that the president is under pressure from the bureaucracy to veto,” as a way of arguing that the bill would actually help the president bring the “permanent bureaucratic interest” more under control. By May and June 1966, the White House documents show quiet lobbying by Moyers in favor of the legislation, advising the newspaper editors what kind of “sharply briefed exhibit” of editorials would have the most impact, and forwarding quotes to White House staff from previous Johnson speeches about the perils of secrecy and the virtues of openness. The signing statement from left to right: LBJ’s handwritten edits, Bill Moyers’s edits, and the final iteration. The US needs to take additional steps to re-emerge as a global transparency leader. In 1966, the US law was the third in world history, after Sweden and Finland; but today, more than 100 other countries have enacted similar laws that open access to government information – and the US FOIA is firmly in the middle of the pack. Canada’s Center for Law and Democracy ranked the US FOIA 46 out of 103 transparency laws in a recent poll, between Tunisia and Trinidad and Tobago. For a truly top-tier transparency law, the US should establish a FOIA tribunal that has the power of the Interagency Security Classification Appeals Panel (ISCAP) to overrule agencies (ISCAP overrules agency classification decisions in Mandatory Declassification Review appeals nearly 75% of the time), and add a public interest balancing test to the requirements for all FOIA exemptions agencies invoke. Without such steps, more countries will continue to pass the US by. Bill Moyers and President Lyndon B. Johnson, talking in the Oval Office, August 24, 1965. President Lyndon B. Johnson in the Amphicar with Eunice Kennedy Shriver and Paul Glynn at the Haywood ranch, April 10, 1965. President Lyndon B. Johnson, Vice-President Elect Hubert Humphrey on horseback at the LBJ ranch, November 2, 1964.